Even if you freeze it, eventually an open package of filo dough will dry out. It is a tragic truth I have learned to live with. However, the result of this is that I needed to finish off a package of filo dough that didn’t have too many sheets left over. 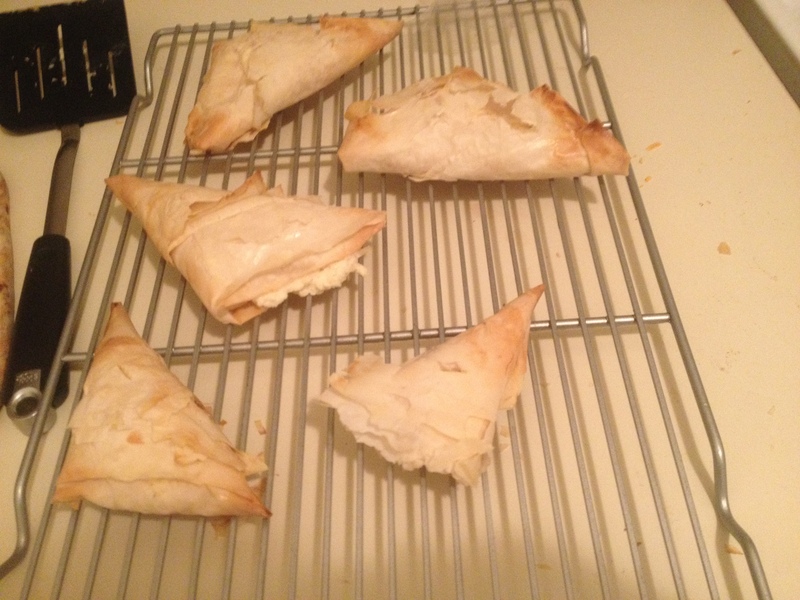 And I hit on this recipe: Honey-Goat Cheese Filo Triangles. Also it looked delicious! I made a smaller recipe though, and made a couple minor adjustments, but it’s basically the same. Blend the goat cheese, egg white and 2 tablespoons of honey together with an electric beater. Stick in the fridge for 30 minutes or so. Once you’ve done that, melt the butter and the remaining honey together. Brush over a sheet of filo dough and fold it into thirds. Add some of the goat cheese mixture to the bottom edge and then fold up the sheet like a flag. Brush the top with more butter-honey and prick the top to let steam out. Stick on a baking sheet. When you’ve used all the filling, bake at 375 until golden. These were good! More savory than I expected, so its not really a dessert per se. One or two of these with a salad makes a nice meal. However this brings me to my issue with the recipe. While these make perfectly good big turnovers, I think they’d probably be way better as little appetizer sized ones, made with a half-sheet of filo. But I haven’t had a chance to test this theory yet. These aren’t super sweet, but they are sweet enough they don’t pair super well with dry wines – I’d suggest a reisling would probably work well – my favorite is the Chateau St. Michelle, which is usually around $10. Song of the week: For the Longest Time by Billy Joel, as sung on How I Met Your Mother. Cheesy? Yes. Awesome? Absolutely.